Israeli Prime Minister Benjamin Netanyahu speaking on June 2 in Jerusalem about the attack on the aid flotilla. 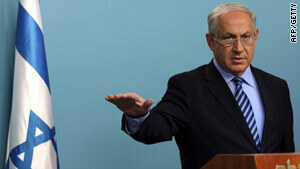 Jerusalem (CNN) -- Israeli Prime Minister Benjamin Netanyahu said Wednesday he and other officials are willing to appear before an investigation into the Israeli commando raid on a flotilla last week. However, he said, only the Israel Defense Forces will question soldiers. "I, the defense minister, the ministers and the chief of staff are all prepared to to appear and give all the facts, but I insisted that the only body that will continue to investigate our soldiers will be the IDF," Netanyahu said in his first public remarks on the raid. Nine people were killed May 31 when the Israeli military boarded a ship trying to break Israel's blockade of Gaza. Israel says its troops were attacked with knives, metal poles and other objects. There have been demands for an international inquiry after the widely condemned raid, which Israel has rejected. "I ask that the whole truth will be revealed and therefore the investigation needs to include also answers to questions that some in the international community prefer to ignore," Netanyahu said. "Who stood behind the extremist group on the boat? Who subsidized them? How did axes, knives, bars and other weapons get on the ship?" he demanded. "The world needs to know the whole picture and we will make sure that the whole picture will be revealed," he said. Israel has said its naval blockade is in place to stop weaponry from reaching militants in Gaza intent on attacking Israel. But critics say the three-year blockade -- imposed after Hamas took over Gaza -- has deepened poverty in the Palestinian territory. The U.N. Security Council has called for an inquiry into the flotilla raid, and the U.N. Human Rights Council has condemned the assault and voted to launch an investigation. Israeli officials have defended the legality of the raid, criticizing those aboard the Mavi Marmara for attacking the boarding party and insisting that they can handle the investigation themselves. On Monday the Israeli military's chief of general staff appointed a reserve general to lead "a team of experts" in order to "establish lessons from the event," the Israel Defense Forces said in a statement.